It was 30+ degrees Celsius here yesterday. Or so. I spent an hour outside weeding the jungle that used to be a garden (after 3 hours the day before and I'm still not done). Such heat (and the mosquitos! I've lost count how many bites I have now) has me longing for the cooler temperatures of fall. I can't wait to be able to dress in layers again, and I've been browsing ModCloth for fashion inspiration. Oh how I love their dresses! I found one that I really really wanted to buy, but didn't because I wanted to run it by Kevin first. He makes sure I don't buy anything too weird (I've regretted buying many things that I didn't check with him first about). 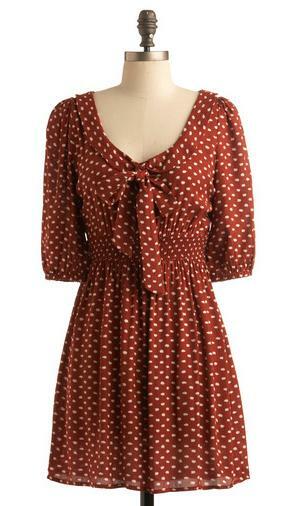 But before I got a chance to buy it, this lovely dress, the Burnt Sienna Sweetheart Dress was sold out! A mere two days after they added it to the site! I'm sure they'll restock it, and when they do, I'll be ready!